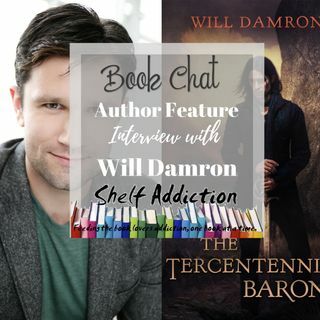 Tonight on Book Chat, I'm interviewing author and audiobook narrator Will Damron. Listen to hear more about his book The Tercentennial Baron. Award-winning audiobook narrator Will Damron proves the pen is as mighty as the sword in his debut novel. Psst...hey you! If you've made it ... See More this far in the show notes--- head on over to shelfaddiction.com to enter into the giveaway!! Enter to win ONE copy of The Tercentennial Baron in ebook OR audiobook! This is a US only giveaway sponsored by Forté Business Consultanting. The giveaway ends on 10/31 at midnight EST. Good luck! Really enjoyed this author interview, thanks!